What’s Good: Dilwale may prove to be an effortless entertainer for those who go without any expectations from it. 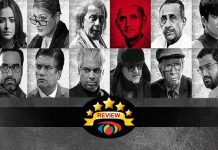 The film never promised to be a cerebral pleaser hence, if you go with the flow, you may even enjoy it. It shifts gears between action, romance and comedy and guess what all three have in common? Cars! What’s Bad: Bringing back the most-loved Jodi of Shah Rukh Khan and Kajol together, the film does not accomplish in capturing their epic romance. The comic capers start to fall apart soon thanks to their repetitive flavor. Loo Break: First Half Would Be A Good Time! Watch or Not? : For those who love to sit back and enjoy movies, this one could entertain you. I couldn’t thoroughly enjoy the film because of its highly predictable storyline. Although for all Rohit Shetty fans, this is another out and out commercial film that they would enjoy. The story revolves around Meera (Kajol) and Raj (Shah Rukh Khan) who belong to two Mafia families having conflicts. Operating in Bulgaria, both Meera and Raj meet in a chance encounter that soon leads to them falling in love. The duo then go on a date that is corny enough, consisting of flowers, ice-creams, dinner and a dance. But, then there is a major twist heading our way. Just when you think love is in the air, guns are fired, blood is flown and soon the two lovers are forced to find separate ways. Strangely, both Meera and Raj have younger siblings who are oblivious of their pasts. Veer (Varun Dhawan) is Raj’s charming younger brother where as Ishita (Kriti Sanon) is Kajol’s younger sister. 15 years later, the ‘adhoori kahaani’ of Raj and Meera comes back to haunt them when their siblings Veer and Ishita fall in love with each other as they now stay in the same town. Will Raj and Meera get over their past for their siblings? Will they rekindle their love as well is what the film further unfolds. What does every Rohit Shetty film have? The two Cs (Cars and comedy). Although Dilwale is not exactly flooded with that. In fact, I would say, with this film, Shetty moves on to the drama much more. The film has conflict, romance and heart-break, something you would not expect in his film. The dialogues are chirpy and typically Sajid-Farhad but after a point they don’t work much. Sanjay Mishra who plays the character of Oscar gets the best comic one-liners where he keeps rhyming his lines with brands. The rest of the story minus its action scenes, rips off quite a lot of stuff from Hollywood. In fact the reason I could not enjoy Shah Rukh and Kajol’s love story is mainly because most of their romantic scenes are blatantly copied from films like Love Actually and P.S I Love You. If that was any less, they even ruined my favorite How I Met Your Mother scene where Ted takes Stella on a 5 minute date by recreating it. 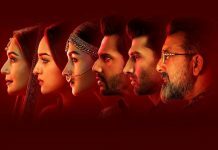 Being a concoction of all genres, Dilwale gets its dose of Bollywood drama by getting inspiration from films like Hum where the ‘Do Bhai’ card comes handy. In fact in one of the scenes, the makers even try to replicate a Pyaar Ka Punchnama monologue and it falls completely flat. Overall, the script of Dilwale seems to have been written after watching several family dramas and rom-coms put together. Shah Rukh Khan looks hot in his bearded avatar and for many, that could only be the selling point of the film. He pulls off the character of Raj with much ease and performs exceptionally well in the action scenes where he shows a lot of agression. He even gets a Shahenshah type entry in one of the scenes as he walks out of a door with a dark shadow. His extreme comfort with Kajol is quite visible in the romantic scenes. Kajol is back after a hiatus of five years and well, she not just looks a little different but acts too. It seems the gap has got the actress a little out of touch and hence in certain scenes, she seems too artificial. Although, peculiarly when her character has a major twist in the first half, she comes off as extremely charged up. Varun Dhawan may have given a breakthrough performance with Badlapur but in Dilwale he seems to be back in his Student Of The Year and Main Tera Hero Days. His comic timing is good but he fails to excel in any particular scene in the film. Kriti Sanon is just a pretty face in Dilwale.Other than looking Ms. Perfect she does not have much to do. Varun Sharma as Siddhu is Varun Dhawan’s sidekick. His comic timing is as always bang on. Sanjay Mishra as Oscar Bhai is brilliant. It is unbelievable how he can pull off films such as Aankhon Dekhi, Masaan and yet do something as crazy as Dilwale. Boman Irani as King is quite boring. The character itself is highly unnecessary in the plot. Mukesh Tiwari and Pankaj Tripathi do a decent job as Shah Rukh’s sidekicks in the film. Rohit Shetty recently released a making video of the film which showed us the nail-biting behind-the-scenes of shooting the dangerous car sequences and I have to say, they actually look quite brilliant in the film. Whether they are important to the plot or not is another debate but at least they look gripping enough. On one hand if Rohit excels at capturing the essence of action, he miserably fails at creating romance. Varun Dhawan and Kriti Sanon’s chemistry is as good as invisible in the film and when it comes to Shah Rukh and Kajol, the lack of originality kills all the excitement. I found it strange how Rohit managed to get Deepika and Shah Rukh look so adorable in Chennai Express but failed to create the same with Shah Rukh and Kajol, in spite of them having a history of epic on-screen romance. Although I would give him credit for giving the duo a chance to show something more than romance and perform some vengeful scenes too like ‘Aaj Ke Baad Mujhe Apni Shakal Mat Dikhana Meera. Jaan Le Lunga’. The lighting is bright for most of the scenes and a lot of colour in each frame, be it the cars, the house all of it. I wish the background score was better. Amongst songs, Gerua and Janam Janam definitely stand out. Daayre is used in the background but does not create much impact. Dilwale is not an enjoyable ride all the way. The film has its moments and mainly it is the predictability and cliches that kill it. One of the best scenes between Kajol and Shah Rukh comes right at the end but its too late to save the film then. For its half-entertainment, I am going with a 2.5/5. Dilwale releases on 18th December, 2015. 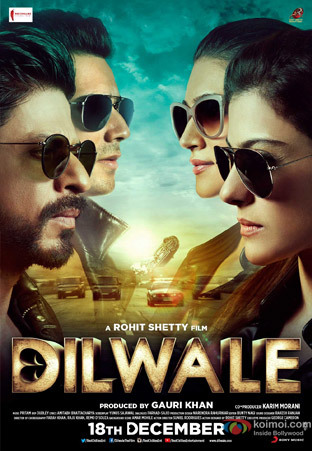 Share with us your experience of watching Dilwale. Now, enjoy reading koimoi.com on your Windows Phone, iPhone/iPad and Android Smartphone. Shazam! 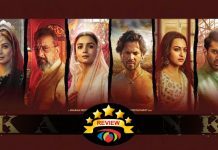 Box Office (India): Dragging Towards The End Before Kalank-Storm! I don’t idiot’s movie. Most of his movies make money just because of people who watch movies to watcu him. His movies uave no real stories.